OGR Forum Click get Brick Give-Away!! and Try our Brickyard Image Sampler! You will need a free copy of Adobe Reader to open these files. This BRICK give-away will not be repeated any time soon. And bricks don't "go bad". So go ahead, download the brick sheet now and then think about what to do with your free brick sheet later! Please Click any topic below to read more! Tell me more about your Brick? 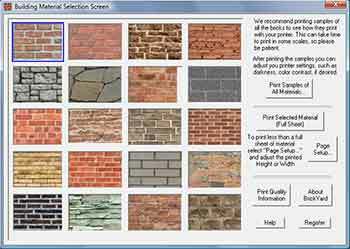 This brick sheet we are giving away is only one of the Twenty patterns included on our $15.00 Brickyard program! Read more about Brickyard here! What should I print my Brick sheet onto? What should I print my Brick with? We really like our Epson Inkjet photo printer, but you can print with almost any modern Inkjet printer and get good results. 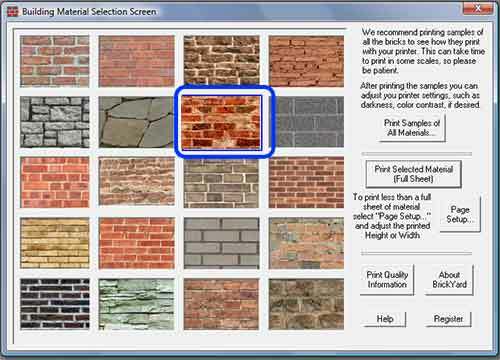 Choose “best” or “best photo” on your printer to get the brick printed with highest detail. Why give away brick paper? We hope to prove to you that brick paper is a cheap and easy way to add detail that might be missing in your layout. And of course, we are hoping you like the brick paper enough to come back to us and get our inexpensive $15.00 Brickyard program. And send your friends too! We never share our customer information. This is a no-strings-attached offer. We will not collect your address for this give-away, or pester you in any way. What if I want to buy Brickyard now, can I have a coupon? Yes. Use BY2 to get $2 off your Brickyard purchase, and FREE shipping too! If I already have sofware from you can I still get a coupon? Yes. Use coupon code NC5 for $5 off a purchase of $25 or more. Can I tell others who might not visit the O Gauge Forum about this offer?